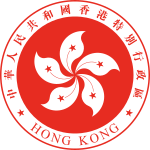 ^ 1997: Hong Kong handed over to Chinese control BBC Accessed 2008-10-16. ^ 臨時立法會保安事務委員會 會議紀要 (PDF). 時立法會. 1998-03-19 [2016-01-20].